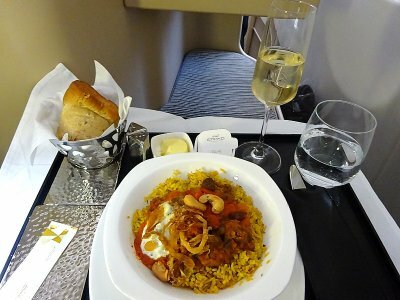 NEWS: Etihad Airways is reducing its meal service, putting smaller planes on routes such as Melbourne (no A380), selling daypass access to lounges for economy passengers (at up to $200USD), selling boy on board snackboxes in economy and no longer providing amenity kits, and axing its free chauffeur drive service in Business Class. Etihad has also ordered a fleet of forty one Boeing 787s, with which it will replace much of the large A330 fleet. If ever there was an airline that has come from nowhere to be a significant force in world aviation, that airline is Etihad Airways. Only a decade ago it was just a mere blip on the ideas board at the United Arab Emirates. Now it operates 70 aircraft, flying to 85 destinations around the globe, carrying 8.3 million passengers a year. It's a biggie. Resolutely full service, high quality airline planes are new, they run (mostly) on time, and there is a comprehensive timetable which means you can transit via the hub in AbuDhabi and get to most parts of the globe. Alas, Etihad has had to look at the bottom line and the business model of it's expansion, and realising the cost of it's investment hasn't realy borne fruit, it pulled the plug on Air Berlin, and indeed reduced Alitalia. A result of the Etihad cost cutting is that there are now far fewer frills, droping business class pyjamas, some of the meals, putting smaller planes on routes, selling daypass access to lounges for economy passengers, and cutting back its free chauffeur drive service. Etihad lounges are pretty woeful – in part because the airline has grown so rapidly there are far too many passengers, and the lounges are seriously packed. Equally, because so many of the crew are so new, they are of a variable quality: this is particularly noticeable up the front of the plane. Etihad Airways reviews often comment on the 'age of the plane', which is frequently brand new, and straight out of the workshops in Toulouse. A large part of this comes from having bottomless pockets, and indeed in 2008 Etihad announced what was the largest commercial aircraft order for 205 new aircraft. It's rather as if the family who owned the airline were playing a game of 'airline millionares' and went around Farnborough going 'well have 20 of those, and 40 of those...' and indeed, that's pretty much what happened. Your reviews of Etihad Airways flights. Because Etihad airline reviews show the planes are so new, they also have some of the most up to date inflight entertainment systems. Etihad brand this system as the 'E-box', which is full AVOD, so you can play and stop video at will, and it packed with far more films and TV shows than most other airlines. Alas, again, being a new out of the box system, glitches are common, and worse the designers looked more at the technical specs of the system than the content – and while there are lots of sunk-without-trace US shows, there isn't much you might actually want to watch. And that is a problem – because Etihad Airlines routes are often long – very long. Etihad – just as Emirates have done – have made much of the 'kangaroo' route between the UK and Australia, and between Asia and the US. Getting from the UK to Abu Dhabi is a decentish flight of 7 hours or so: just enough time for a good lunch and dinner. It is the onward stretch to Australia that can go on for upwards of 15 hours. On that flight you need decent IFE – and three good meal services come to that. Which in economy you don't get. Add in a hub that is bursting at the seams and a so-so terminal, and it really isn't the best. The name Etihad means "union" in Arabic, and is an attempt to show that the UAE can be very much a world player. Indeed, Etihad has recently adopted the slogan from From Abu Dhabi to the World, and as such the crew on your Etihad flight will be very much international, but with a strong Australian/UK bent, and leaning on the younger side too. This is not always a good thing: service in the premium cabins can frequently be decidedly lacking, with the passengers sometimes having to tell the crew what they should be doing. Which is a shame, as the meals onboard in all three classes are often very good indeed. In Business there is a lighter "kitchen anytime" menu available at any point in the flight, and the arab-inspired meals are distinct highlights. 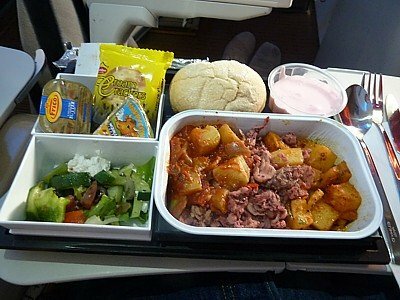 In economy there are two hot meals – and an inflight snack – on the ultra long 15 hour treks to Australia and the US. And yes, I did say three classes, not four. 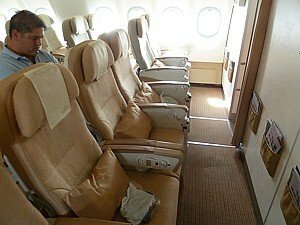 Etihad Premium Economy has been avoided by the airline: apparently in the Arabian market those up front like to know they are a long way from those down the back, and a middle class doesn't sell well. So is Etihad any good? A reserved yes; provided you end up on one of the decent planes, and you get a good crew: in economy it is certainly better than Emirates. Etihad Business Class can be so-so, with the rammed pearl lounge at Abu Dhabi, and lack-lustre crew. However the way the fares are so much cheaper than some other airlines can be a distinct bonus. All in all, it isn't too bad a way to fly.